LINCOLN, Illinois (May 20, 2016) - For the second time in as many starts, Wooster, Ohio’s Sheldon Haudenschild earned a trip to Arctic Cat All Star Circuit of Champions victory lane, this time during a first ever appearance at the Lincoln Speedway in Lincoln, Illinois. Haudenschild took advantage of a lap-17 restart to earn his position at the front of the field, driving around pole sitter Parker Price-Miller on a rubbered-up racing surface to clinch a second consecutive, $5,000, Arctic Cat All Star payday. The pilot of the Southern Pacific Farms/No. 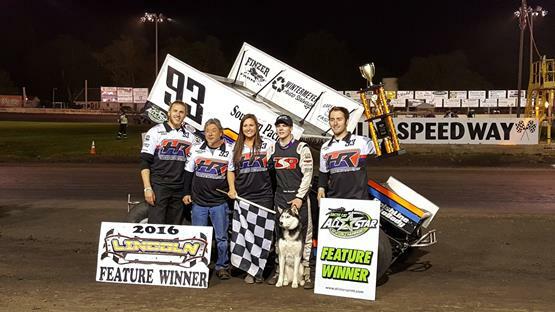 93 now has eight career main event victories with the Arctic Cat All Star Circuit of Champions, raising his 2016 win total to two. Parker Price-Miller would hold on to finish second, followed by “Downtown” Danny Holtgraver, his second consecutive All Star podium finish. Sheldon Haudenschild raced in a podium position during the entire 35-lap main event, getting away third after the initial start before capturing second from Chad Kemenah on lap two. Haudenschild made early challenges for the top spot by lap four, attempting back-to-back slide jobs on leader Parker Price-Miller, but Price-Miller prevailed and maintained control. It would be lap 17 before Haudenschild could make a bid for the top spot stick, driving around the outside of Parker Price-Miller during a single-file restart. Haudenschild controlled the remaining distance, surviving one additional restart on lap 22. The Arctic Cat All Star Circuit of Champions will continue their trek through the Midwest on Saturday, May 21, with a visit to the Wilmot Raceway in Wilmot, Wisconsin. Arctic Cat All Star competitors will race head-to-head with the Interstate Racing Association (IRA) Outlaw Sprint Series on Saturday night, dueling for a $5,000 top prize during the Fifth Annual IRA/All Star Sprint Challenge. Dale Blaney, the six-time and defending All Star point champion, will lead the charge into Wisconsin on Saturday evening. The Ohio native has earned the last five Arctic Cat All Star main event victories in the “Badger State,” including four consecutive IRA/All Star Sprint Challenges. Wilmot Raceway will open pit gates for race teams at 12-noon on Saturday, May 21. A mandatory drivers meeting will be hosted at 5:30 pm, followed by warm-ups at 6:15 pm. Racing is scheduled to hit the speedway at 6:45 pm. Those seeking additional information should visit Wilmot Raceway online at www.wilmotraceway.com.